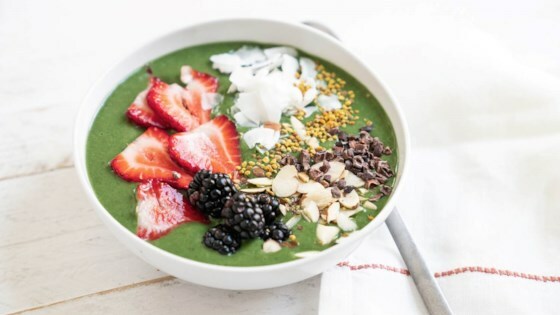 "This green glow smoothie bowl will have you glowing from the inside out! Spirulina powder adds a hit of nutrients to this satisfying way to get your greens." Place banana, spinach, water, pineapple, whole almonds, celery, vanilla extract, and spirulina in a large high-speed blender. Blend until smooth, stopping to scrape the jar as necessary. Taste and stir in maple syrup. Pour mixture into a bowl. Garnish with blackberries, strawberries, cacao nibs, sliced almonds, coconut flakes, and bee pollen. Serve immediately. Substitute agave syrup for the maple syrup, if desired.